Cold Rolled Steel Sheets and Plate are cold rolled to extremely accurate thicknesses tolerances, which provides a fine, smooth surface creating an excellent base for painting. In addition, cold rolled steel sheet and plate is easy to drill, form and weld. Bonderized sheet and plate is a galvanized metal product that has been soaked in a phosphate bath and then put through a chromate drying process, which allows the metal to accept paint. 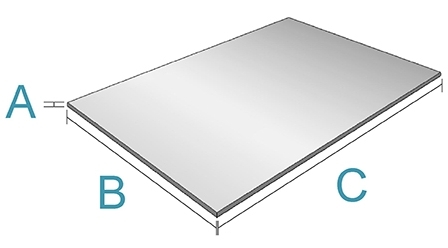 Bonderized sheet and plate should be immediately painted after installation, since the exposed phosphate coating is susceptible to white rust. Galvanized sheet and plate is regularly used in applications where corrosion resistance is a necessity. Galvanized sheet and plate is easy to drill, form and weld. They also provide a lifespan of 20 years or more depending on the application. Additionally, galvanized sheet and plate is designed to provide long service at moderate temperatures. Industrial Metal Supply Co. offers hot rolled, cold rolled, bonderized and galvanized steel sheet and plate in a broad range of lengths, widths, gauges, alloys, and specifications to meet your material requirements. We stock steel sheet and plate in 36”, 48”, and 60” widths and in 96”, 120”, and 144” lengths. We can also provide custom cut-to-size sheet and plate to fit your exact specifications. View our inventory to find the hot or cold rolled steel plate and sheet you need, or use the filters at left to narrow your search. Request a quote today, or contact us for more information.